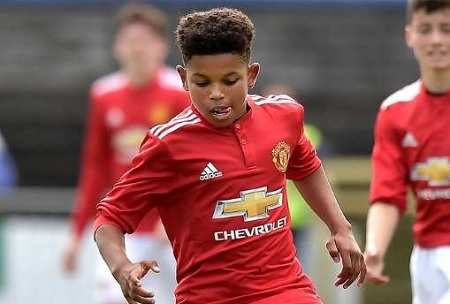 Shola Shoretire, a Nigerian-born 14 years old Manchester United's wonder kid Shola Shoretire has become the youngest ever player to appear in the Uefa Youth League at the age of 14 years and 314 days. Shoretire came off the bench in Man United U19’s 2-1 Uefa Youth Cup win over Valencia on Wednesday, also making him the youngest player to feature in the competition to date at the age of 14 years and 314 days. The Red Devils went into the game with four wins and a draw behind them and came about against Group H’s bottom side at Estadio Antonio Puchades. It was the hosts, however, who came flying out of the blocks and enjoyed the lion’s share of both possession and chances in the opening exchanges. The winger has already been called up to a U23 training camp in Austria over the summer, with Man United coaches describing Shoretire as an ‘exceptional talent‘ and has now taken the next step on what looks to be a promising career. Shoretire has trained with England youth sides in recent years but is also eligible to play international football for Nigeria.